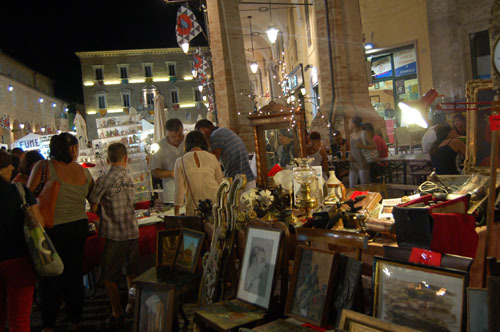 Fermo Antiques Market in Marche, compared to Arezzo in Tuscany, is not as big and doesn’t have as many furniture or larger antique stalls but the atmosphere is fabulous. 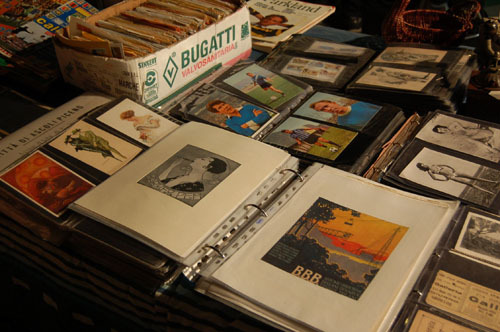 It’s held every Thursday evening during July and August and when darkness falls around 8 30 pm it gets very busy and there’s a distinct hum of excitement, money exchanging hands and everyone looking for a bargain. 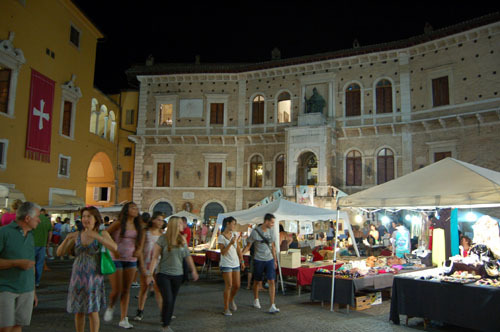 It was a wonderful balmy evening last Thursday and we met friends for a delicious supper in the Capolinea Café before strolling around the market and savouring the excellent variety of goodies on offer including local crafts, food, bric-a-brac and antique stands. 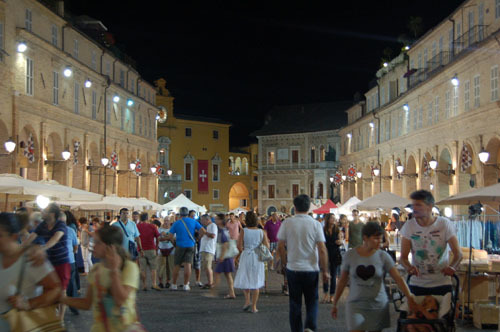 The Piazza del Popolo was buzzing with a mix of tourists and locals enjoying the relaxed ambience, friends greeting each other, laughing and chatting in that familiar Italian animated way, arms and hands flying, purchasers and vendors negotiating for lowest or highest price depending on which side of the deal they were. The Italians strolled about in family groups, like little gangs, Nonna holding the hand of the little ones, Mamma or Babbo, pushing the buggy and straggling behind them, the teenagers eagerly keeping an eye out for school friends they could escape with to enjoy a coke and a conspiratorial chat. 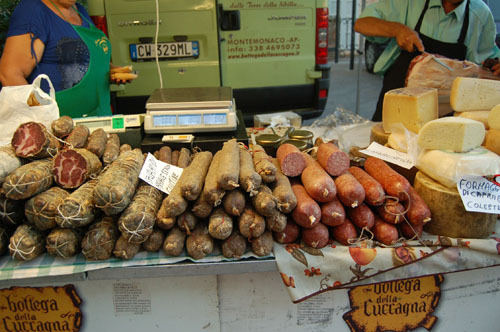 Apart from the main square the market spilled over into the big road leading from the Piazza and several side streets; the stands here were mostly craft and local foods, salamis, pecorino cheeses etc., A favourite of mine is ciabuscolo which is a smoked and dry-cured sausage made from pork meat and fat, typical of the Marche region. I love the moist texture and spicy taste. Not sure it’s good for your heart though to eat too much of the delicious stuff. 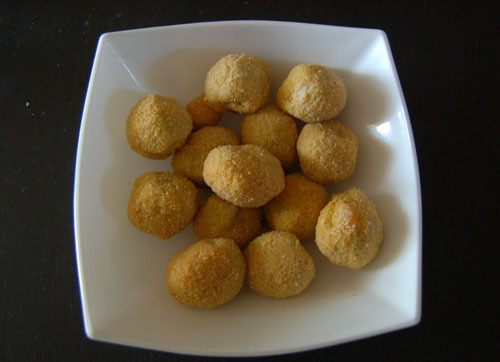 Olive Ascolane are another popular local dish; large green olives which are pitted and stuffed with sausage meat, dipped in breadcrumbs and deep fried. Yummy, my mouth is watering! Hope to make the market at least another twice before then end of this season! 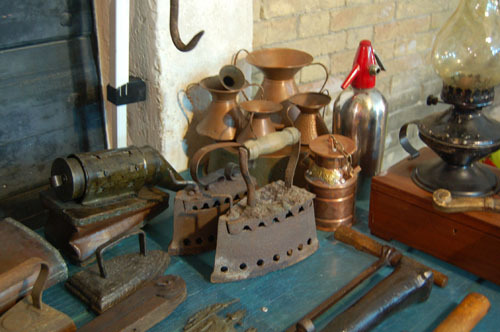 This entry was posted in Other and tagged antiques, bric-a-brac, cafes, cheese, ciabusolo, eating, families, Fermo, food, italian, markets, olives, salamis by Ninette90. Bookmark the permalink. This lovely newsletter. Creates real warmth for Le Marche as well as sense of news and information. Must find a way of connecting them to guests. Thanks Steve. Love your website! Looks great, must get there soon. Your photos are lovely, Ninette!